Let me share with you a glimpse of my life with a newborn. (I won’t mention how many years ago.) For new mom’s, a diaper bag is a necessity. No longer do mom’s stay at home all day, taking care of the home and the kids. Moms are busy creatures – careers, friends, hobbies, you name it. Of course, I had a diaper bag – a huge, clunky, heavy when filled diaper bag that I had to carry in my hand, along with baby, keys, groceries, and various other things. Imagine yourself trying to get everything into the house without making trip after trip. Diaper bags were large – the larger they were, the more ‘stuff’ you could put in them. Oh, I forgot to mention the purse most women carry. I used my diaper bag as a purse and a diaper bag – I already had enough in my hands. Still, it was sometimes extremely difficult to get from car to house, or car to restaurant, or car to anyplace. Fast forward to 2019 – a backpack diaper bag? What? Why didn’t I think of that? Imagine grabbing your diaper bag, strapping it on your back, then holding baby as you go from car to wherever you are going. Yes, to moms of my generation – a dream come true. So, let’s have a look at some of the best baby backpack diaper bags. What Do You Actually Need in a Diaper Bag? 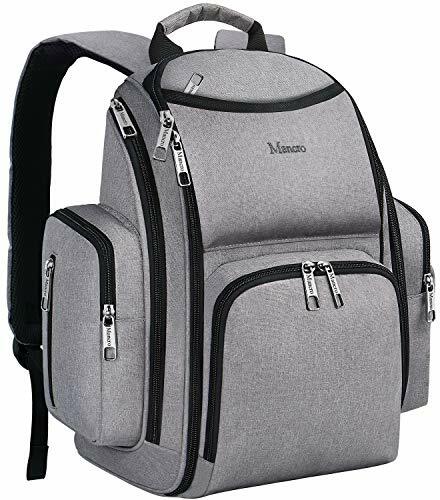 The Mancro Diaper Bag Backpack is a spacious, unisex backpack that is suitable for mom or dad. 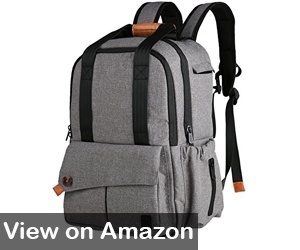 This backpack is one of the best backpack diaper bags for travel, featuring a water-resistant construction and antitheft design. The stylish design makes this the perfect accessory for mom or dad in any setting – travel, restaurant, shopping, church, anywhere you need to go with baby in tow. Because it is water-resistant and can be carried three ways – by the handle, strapped on your back, or strapped to baby’s stroller, this backpack diaper bag would be ideal for long walks, hiking, and camping trips. Has 14 compartments for easy organization. Includes 2 insulated pockets for bottles on one side and a diaper wipe pocket on the other side so that these items are easy to get to when needed. Shoulder straps are padded and adjustable, offering all-day comfort for mom or dad. Zippers zip all the way down so that each compartment is fully open, allowing you to see what is inside, eliminating the need to blindly dig through each compartment to find what you need. Included are stroller straps so the backpack can easily attach to baby’s stroller for hand-free carrying and a changing pad to make changing time easier for mom and dad. Some parents were disappointed in the durability of the zippers – stated zippers were difficult to maneuver and slid off-track easily. Perhaps one of the best backpack diaper bags for twins, the roomy Big Nation Diaper Bag Backpack provides plenty of room to store baby’s things while on the go. With 14 pockets, it is designed to provide enough organization that mom or dad do not have to root around in the bag to find what is needed. It also includes a large changing pad, an insulated bottle pocket with room to store multiple bottles, and includes an extra sundries bag for even more storage. Keep everything you need to travel with your little one (or little ones) within easy reach. Water-resistant and durable fabric make this backpack diaper bag great for outdoor adventures. Unisex design so both mom and dad can use it. 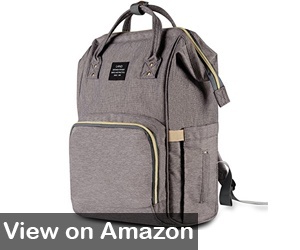 Lightweight, with ergonomically designed padded shoulder straps for comfort during long walks, hikes, or shopping. Hooks easily to baby’s stroller for absolute hands-free use. Equipped with an extendable keychain so that mom or dad can easily unlock the car without having to place bag or baby on the ground. When placing the bag on the floor or ground, it falls over rather than stand up, making is difficult to access the contents of the bag. The HaloVa Diaper Bag is multi-functional and is stylish enough to be used as a diaper bag or hand bag. One of the best backpack diaper bags on the market, the HaloVa offers lots of storage and compartments for ultimate organization. This backpack diaper bag offers lots of room for storage and is one of the best backpack diaper bags for two kids on the market. Go anywhere with your kids and look stylish while doing it. The HaloVa diaper bag can be used as a diaper bag (carry by handle or use shoulder straps) or a hand bag making it a versatile and stylish bag for any mom. The insulated bottle pockets are equipped with elastic straps that hold the bottles in place for less worry of spillage. Durable oxford fabric is water-resistant and easy to clean (not machine washable). Includes a compartment for wet clothes to be stored away from dry clothes. Easy access back pocket ensures everything is in reach without having to dig through the entire backpack. Stands on its own without falling over or needing to be propped against a wall or chair. Stroller straps and changing pad are not included. 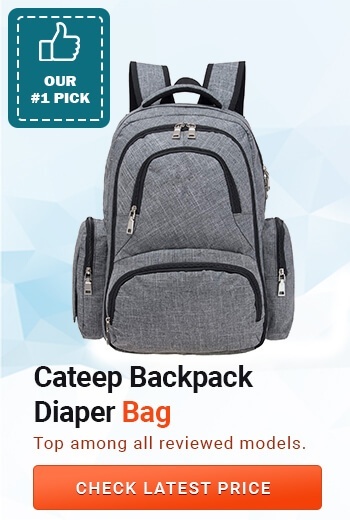 The Cateep Baby Diaper Bag is also one of the best backpack diaper bags for two – the insulated bottle pocket holds up to 3 bottles and includes 3 spoon slots so that baby’s utensils are always handy. After babies outgrow the diaper bag, it can be used to carry all your older children’s needs – including tablet and laptops in the padded pockets. 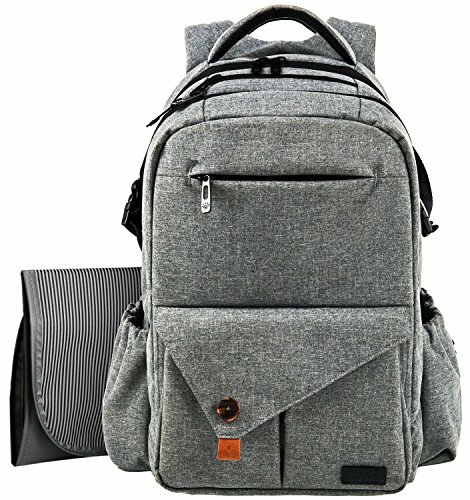 Multifunctional, this backpack can be used as a diaper bag, school backpack, laptop backpack, or travel backpack – and is stylish enough for any occasion. 16 spacious pockets offer the maximum in storage and organization. Pockets include a pacifier pocket, easily reachable tissue pocket, and 2 waterproof pockets for storing wet cloths or clothing. Equipped with insulated pocket that holds 3 bottles and includes an additional insulated sleeve. Magnet open/close makes it easy for mom or dad to open and close pockets with one hand. The most common complaint is that the inside of the bag emits a strong odor. One of the best large backpack diaper bags on the market is the Sleeping Lamb Baby Diaper Bag Backpack. 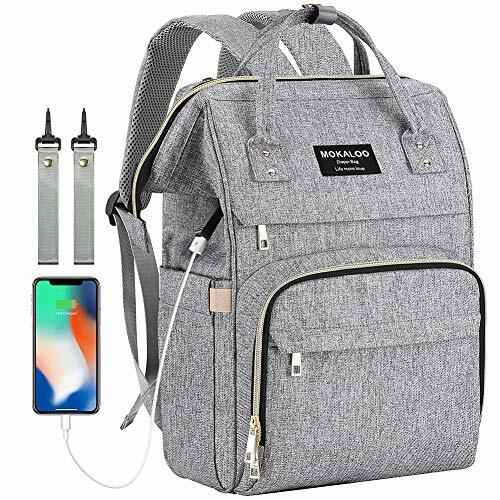 This versatile and multifunctional backpack diaper bag can be used by mom or dad, and functions as a diaper bag, everyday backpack (school or work), laptop bag, or travel bag. 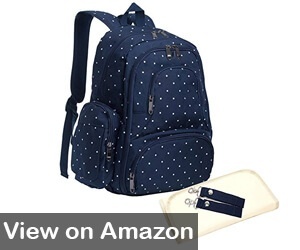 With dimensions of 16.9×7.1×15 inches, this 100% polyester backpack diaper bag offers lots of storage and is easy to wipe clean. Fashionable and functional, this is a must-have travel companion with or without baby. 16 large pockets – some padded, some insulated, and some mesh to meet all your baby storage needs. Additional zippered pocket inside the bag for mom or dad’s wallet, keys, cell phone or other personal items. Has a moisture-proof pocket for baby’s pacifier and a water-resistant pocket for wet clothes. There is also a waterproof pocket on the bottom that will hold wet diapers and/or a small umbrella (something to always have on hand when outdoors). Equipped with cushioned shoulder straps and breathable mesh panels for the ultimate in comfort on long walks or hiking trips. Changing pad and stroller straps are included. The bag is not water-resistant, although there are water-resistant pockets. The Ferlin Multi-functional Large Baby Diaper Bag Backpack is stylish and water-resistant – a great bag for mom or dad. 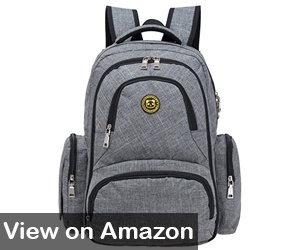 This multi-functional backpack diaper bag grows with your baby and can later be used as a school backpack, laptop backpack, or travel backpack so that your child’s every need is available in every circumstance. This Ferlin backpack diaper bag is built to last, providing years of storage space for parents on the go – whether on short trips, long walks, all-day shopping trips, or travelling around the world, everything you need for baby (or older child) is always right at your fingertips. Has 18 pockets for the ultimate in storage and organization – keep everything neat and organized so that it is always within easy reach. Includes a changing pad to make changing on the go easier. 3 insulated bottle pockets so you always have plenty of bottles and food for baby – at just the right temperature. Waterproof, making it an ideal backpack diaper bag for introducing baby to the many outdoor adventures that are available. Padded shoulder straps make it comfortable for all-day wear. 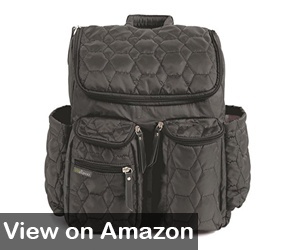 The quilted nylon fabric of the Wallaroo Diaper Bag Backpack is designed to be water-resistant and tear-resistant for a durable and functional backpack diaper bag for busy moms and dads. With adjustable, padded shoulder pads, this bag can easily be worn comfortably for extended periods of time. The durable material and stylish design make this a great backpack for both mom and dad – and is suitable for any occasion. The diaper bag grows with your child and can be used as a laptop bag or school backpack once baby has outgrown the diaper bag. Three ways to carry – hand strap, shoulder strap, and stroller straps make this versatile and easy to switch carrying methods. Changing pad and wet bag included for easy diaper changing and storage of wet clothes. Comes with 2 insulated cargo pockets for storing baby’s food and two insulated side pouches for baby’s bottle or sippy cup or mom’s drinking bottle. Padded inside pocket can easily store mom or dad’s laptop along with baby’s supplies. 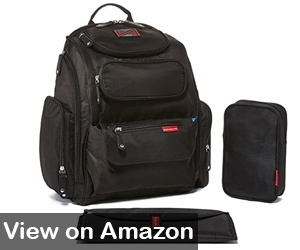 Does not have as many pockets as other comparable diaper bag backpacks, making it less organized than some. Before we get to the reviews, let’s pause a minute and thing of that huge, bulky, packed-to-the-gills diaper bag I mentioned earlier. It’s just natural – the more room you have, the more junk your carry around. I probably did not need most of what was in the diaper bag – and I usually lost the most important items amongst the junk. As handy as they are, diaper bags can also be a headache. Diapers and Diaper Wipes (of course) – 1 diaper for each hour you will be away from home. Change of clothes – I never took any chances here. I always packed several changes of clothes. Babies are messy, after all. Extra pacifiers – if your child takes a pacifier, your will learn quickly to never leave home without a few spares. You DO NOT want to be in the middle of the mall with a child that has lost a pacifier! Medications – It is always a good idea to have medicine on hand in case baby starts running a fever (especially when teething). You should also take any medication your baby takes on a regular basis, just in case you do not make it home before time for the next dose. Just the basics – no need to pack everything but the kitchen sink. As a parent of multiple children – and an aunt helping to raise my brother’s twins – I understand the importance of choosing a diaper bag. The primary features that I considered while reviewing these backpack diaper bags were functionality, durability, storage space, organization, and convenience. A diaper bag is often used on a daily basis – especially in today’s world, when both moms and dads lead busy lives. Thus, durability and functionality are extremely important aspects. If you spend a lot of time outdoors with baby – hiking, camping, walking – your diaper bag must be water-resistant, so everything packed inside stays dry and safe from the elements. 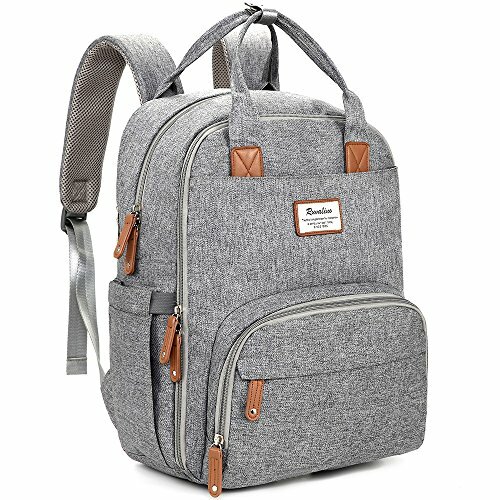 I also consider functionally an important consideration – if you purchase a quality backpack diaper bag, it will last years beyond the diaper bag stage. A diaper bag that can later be used as a school backpack, laptop bag, or travelling backpack for adult or child is just icing on the cake. As all my fellow parents understand, storage space and organization can often be a deal-breaker. Diaper bags of the past often had a couple of compartments, but baby’s supplies were just piled into the two compartments – and once you dug into it to find something, there was absolutely no resemblance to anything organized. So, each time you had to find something, it often entailed a long search, possibly even taking everything out of the bag and replacing it once you found the item you needed. 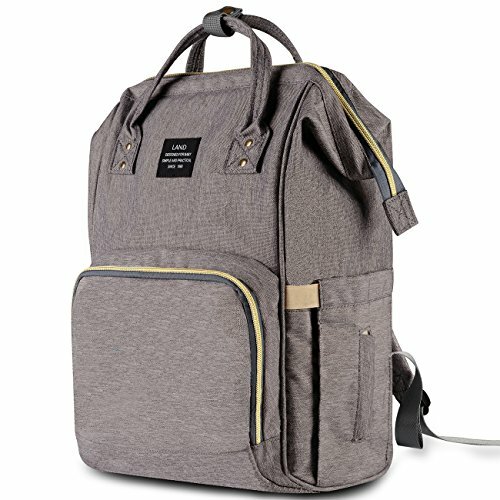 Backpack diaper bags offer an entirely unique experience for parents. Extremely convenient, I can’t imagine going back to the unorganized, bulky diaper bags of the past. With these considerations in mind, I feel the best backpack diaper bag is the Ferlin Multi-Function Large Baby Diaper Bag Backpack. With a name like that, it should meet all a parent’s expectations for size, organization, convenience, and functionality. I like the fact that this bag is water-resistant and stylish – designed for use by mom or dad. I also like the fact that it is multi-functional and can be used long after baby has outgrown the diaper bag stage. With 18 (I repeat, 18!) 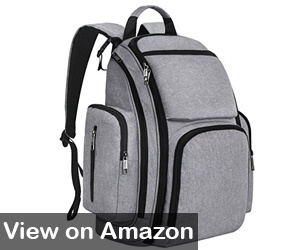 pockets, this diaper bag backpack offers the ultimate in organizing capabilities – including insulated pockets for food and bottle storage, padded pockets for laptop storage, and pockets for storing parent’s accessories. The only drawback for this backpack diaper bag is that stroller straps are not included – but I believe innovative parents can find a way to attach it to the stroller when a break is needed from carrying it on their back. Overall, with all the features and the durability and versatility of this bag, I feel the Ferlin Diaper Bag Backpack is the best backpack diaper bag available for on-the-go parents.